Helena – Most people in Lewis and Clark County rely on city, County and State snowplows to clear snow from the roads where they live so they can go about their daily lives. Plowing the roads is not an easy task and is more complicated and even dangerous when drivers do not pay heed to the plows and basic safety. Lewis and Clark County has reminders for people to keep themselves, other motorists and snowplow drivers safe this winter. Keep your snow on your property. A huge hazard is created when snow is placed in the right-of-way, especially if a snowplow has already been there. Vehicles drive over the snow and pack it down, creating huge bumps and a serious driving hazard. Additionally, it is difficult for the snowplows to get that snow off the roads once it is packed down. Do not crowd the plow and do not pass them. 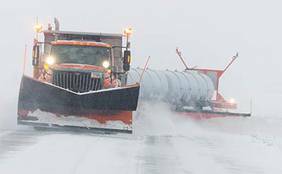 Snowplow drivers have limited visibility and are focused on the road in front of them. Do not assume they can see you. Additionally, snowplows are not just removing snow, they may be placing sanding material on the road. Larger pieces in the material may bounce when hitting the road and can cause damage to vehicles following too close. Give them room on the centerline. Snowplow drivers need room to plow the centerline. Slow down and move over if you are able so they can get the roads cleared down the middle first. As time allows, they will go back and do more sweeps to widen paths. Dim your headlights. When behind a snowplow, turn off your brights. The mirrors on the snowplows point down so drivers can see the road, meaning passenger vehicle headlights shine directly in their eyes. It makes it nearly impossible for them to see, especially with new headlight technology, when brights are on. Find off-road alternatives for parking vehicles and trailers and remove garbage cans. When snowplows go around parked vehicles, trailers, garbage cans or anything else in the right-of-way, it leaves berms. Once vehicles and objects are moved, those berms are driven over and packed down, creating bumps and driving hazards. Roads are better plowed and maintained if plow drivers can make straight passes. Take responsibility. Get snow tires, give yourself time, and do not drive with a frosted windshield. It is worth taking a few extra minutes to make sure you have full visibility and do not have to hurry. Keep snowplow turnarounds open. Most snowplow turnarounds are marked by signs. If plow drivers cannot turnaround because of obstructions, the entire process of getting all roads cleared takes longer. Along with helping the snowplow drivers get your roads cleared, here are some additional things to keep in mind. Be safe when working on your property. Snowplows can throw snow a long way. If working in the path of the snow a plow is throwing, get out of the way! Keep bushes and brush trimmed back from the road. When road graders are used for additional snow removal, equipment can be damaged by vegetation that has grown into the right-of-way. This damage requires time and money to fix that could be better used for plowing and maintaining roads. Lewis and Clark County has ten road maintenance districts, seven districts in the Helena valley and one each in Lincoln, Augusta and Wolf Creek. Combined, the County plows approximately 550 miles. This does not include multiple passes, which doubles, triples and quadruples mileage as more passes are made. In winter, the priority roads are school and postal service routes. Drivers also assist law enforcement and emergency responders when needed. It is the goal of Lewis and Clark County to try to plow every County-maintained road at least once per day during a snowstorm. Motorists should slow down when driving on sanded roads. Speed causes sand material to blow off the road, making it ineffective. Finally, for liability reasons, plows are not able to help other vehicles get unstuck; however, if everyone stays patient, slows down and follows these tips, there will be no need for help to get unstuck!